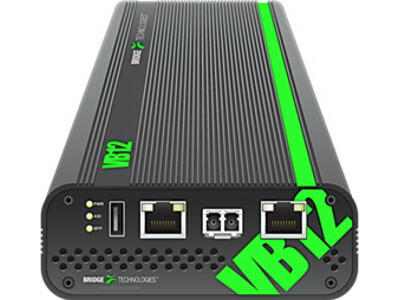 The VB12 is a portable broadcast and IPTV monitoring and measurement platform. It supports optical and electrical GigE Ethernet inputs, separate management port and both ASI input and output. Featuring both optical and electrical GigE Ethernet inputs, separate management port and both ASI input and output, the VB12 has the widest range of built in interfaces in the industry. The ability to monitor continuously 10 services with full TR 101290 alarming and analysis makes the portable VB12 invaluable for field use. Its ruggedised exterior and fanless design give engineers the perfect fault-finding tool or for permanent placement in harsh environments. With full TR 101290 alarming and all modern codecs, the VB12 is built for real-world use. Critical parameters such as RFC4445 - MDI and detailed jitter values give accurate readings of network performance. With the RFC4445 based patented MediaWindow, historical data can be easily accessed for meaningful visualisation of media flow in an IP network. The power of confidence monitoring is further enhanced by continuous monitoring of TR 101290 parameters, bandwidth overflow/underflow and signal loss. With advanced threshold settings including error-seconds, alarm granularity can be set to reflect actual status. SNMP trapping and XML export enables the IP Probes to be implemented in any NMS system (with alarm generation either directly from the probes themselves, or via the VBC server) for advanced alarm correlation and filtering. Each VB12 runs an integral HTTP server with the client as a web browser, so no need to install custom software on computers needing access to the measurement data. Basic setup is achieved through the built-in USB to RS232 converter, eliminating the need for an external interface and facilitates setting of IP addresses for access to the VB12. The device can also be controlled remotely via TELNET or XML configuration commands.